Target has acquired San Francisco-based transportation technology company Grand Junction, in order to help it move more quickly into the business of same-day delivery. The company had already been working with Target on a same-day delivery pilot program in New York’s Tribeca neighborhood, prior to this deal. That pilot will expand this fall to more New York area stores before a broader rollout to other large metros starting next year. The retailer had already dipped its toe in the water of on-demand, local delivery. It has tested same-day delivery in 2014, and later in partnership with Instacart. And this May it announced its plans for Target Restock, a next-day delivery service focused on “everyday essentials,” like household items, personal care products and other dry goods – similar to those you can order through Amazon Prime Pantry. 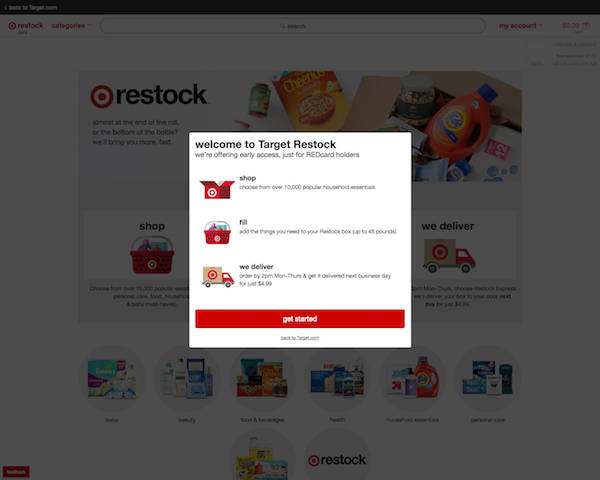 The Restock service had been in testing with staff at Target’s headquarters before expanding to a consumer-facing pilot with customers in the Minneapolis-St. Paul area, where Target is based. Around the same time, Target also announced a small test of same-day delivery in New York. The pilot allowed guests shopping the Tribeca location to have their in-store purchases delivered anywhere in Manhattan, and to parts of Brooklyn or Queens. This eliminated the need for customers to haul their heavier purchases home themselves, or on public transit. Grand Junction’s technology was used in this NY area test, Target says. The company offers a software platform that’s used by retailers, distributors and third-party logistics providers to manage local deliveries through a network of more than 700 carriers. The software helps to determine the most efficient, fastest route for a local delivery, while also tracking deliveries and giving the retailer an overview of carrier performance. By bringing this technology in-house, Target says it will be able to offer same-day delivery in more areas, as well as assembly and installation services. Potentially, this could be used to speed up Target Restock from a next-day to a same-day delivery service, as well. However, the deal is about more than just same-day, Target says. That includes all last-mile logistics needs, from regular online orders to same-day or next-day from stores. With the acquisition, Target gains immediate access to Grand Junction’s technology and carrier network, which will allow it to more quickly move into same-day delivery. Grand Junction’s 13 employees will become a part of Target’s technology team in San Francisco, where they’ll best tasked with expanding the New York area pilot this year, ahead of a wider same-day delivery service rollout next year. Same-day delivery is an area where there’s an increasing amount of competition. Amazon today offers Prime Now in over 30 U.S. markets, promising 2-hour delivery of thousands of items. A good handful of same-day grocery delivery services are also gaining steam, including Instacart, Shipt, Peapod and others. There’s also Postmates for restaurant and general product delivery. And Uber is figuring out how to leverage its technology for than just moving more than people. Meanwhile, Walmart has doubled down on a same-day pickup service for groceries, and even incentivized customers with discounts when online customers chose to ship items to the store for pickup instead of delivery. Walmart has also taken on Amazon with a free 2-day shipping service and has begun testing using store staff for last mile deliveries. The move could help Target retain its footing as more brick-and-mortar stores face waning foot traffic and store closures. Target’s online sales have been improving, having rose 22 percent in the last quarter, but it still faces huge threats from Amazon and Walmart in this area. That’s especially true when it comes to groceries – something that’s been made worse by Amazon’s acquisition of Whole Foods. However, Target recently boosted its Q2 earnings forecast due to an expected increase in comparable-store sales.